Despite neighbors’ objections, the construction of 1410 Stanyan Street was approved for development and finished last year, “pushed, squeezed [and] shoehorned into the space between two existing homes,” one on Clarendon and the other on Mountain Spring Ave. 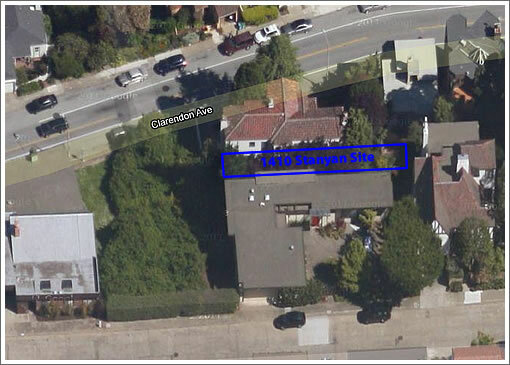 The green space in front of the property is an undeveloped and currently unbuildable stretch of Stanyan Street and upon which the owner of 1410 Stanyan is now seeking his neighbors’ support to build a driveway. For as it stands, there’s currently no legal way to access the property which was on the market last year for $2.5 million, not even by foot. The owner of 1410 Stanyan wanted to construct a driveway to Clarendon Street when he was building the house, but in view of strong neighborhood opposition and a technicality whereby he apparently did not involve the right City departments, it never happened. Instead, it appears that the only approved access to the house is via a staircase up to Mountain Spring Avenue which some neighbors said the owner got by way of some kind of exchange with the neighbor above to limit his building height so as not to obstruct that person’s views. It appears, however, that the staircase to Mountain Spring, despite being approved, was never built. At the same time, many of the Mountain Spring neighbors have expressed opposition to building the staircase as they seem concerned with the prospect that UCSF people will catch onto its existence and start using Mountain Spring — normally a quiet street — for parking. Apparently the UCSF people already use Clarendon for parking, annoying many residents of Clarendon and the Stanyan Steps north of Clarendon. 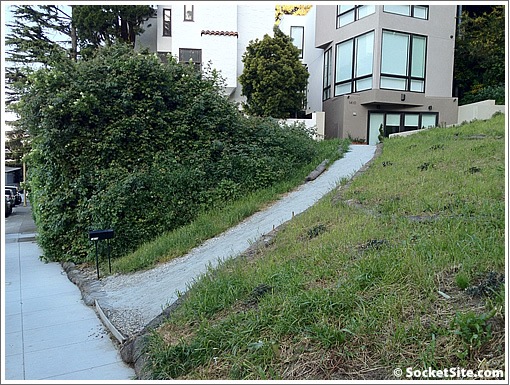 Instead of the staircase to Mountain Spring, access to 1410 Stanyan is currently via a dirt footpath through that stretch of undeveloped Stanyan Street to the house. Many neighbors have contended at the meetings that the dirt path is illegal, which it may be. Some neighbors have also said the path is both dangerous and an eyesore. Interesting, I live just four blocks away so I’m going to go have a look around and see what the neighboring houses have to complain about. Whoah whoah whoah. When did this become about parking on Polk Street? How did they build the house if there was no legal way of reaching the property? Plenty of homes in town have no driveway. Why should this apparent lawbreaker be allowed to encroach on property they don’t own, simply because they say they are sorry? Looking at google maps it looks like there are a couple of similar properties on the other side of Clarendon (between Belgrave & Clarendon) that have no street access, but maybe a foot path was created for them? The parcel is legal, so it’s required that an easement be created somewhere, but I don’t think a driveway is necessarily required, so the neighbors may have some standing. Interesting. It seems the stretch of Stanyan Street across Clarendon street also have several houses fronting only a trail. A staircase and/or trail on this hillside makes whole lot of sense. The code only says that a legal lot has to front the “Public Way”. There’s no requirement that it be paving, stairs, or otherwise improved. This is just so they have an escape route in an emergency. That said, it would be pretty tiresome to walk up grass to your house everyday, but I highly doubt they’ll allow a new driveway on city property. Po Hill Jeff, the answer to sfmichael’s question is that the permit to build the building had a compliant way of reaching the property. The contractor/developer/owner just decided to not install it. I checked the permit history for this address and notice the permit to construct this building (PA# 2004-0715-8977) was never “finaled”. For all intents and purposes the project is still “under construction” and not “finished”. The headline is not technically accurate. There is a legal way to reach the house — the developer-owner has a permit to build a staircase from the house to Mountain Spring, and can build it at any time. The owner hasn’t built it because he wants a driveway from the house to Clarendon instead (for obvious monetary reasons), and in the meantime, he has taken it upon himself to create a pretty substantial, unpermitted walkway from the house to Clarendon across a public lot. I’m a neighbor and have had the pleasure of witnessing the meeting “spectacles” first-hand. I wasn’t around when the house was originally built, but to hear the neighbors tell it, the developer-owner’s original house design included a driveway across the public lot (currently used as a Community Garden) to a garage. The driveway across the public lot was rejected by the City, and in order to get the building permits for the house over neighbor objections, the developer-owner agreed that the only street access to the house was going to be via a staircase to Mountain Spring, similar to the way the Stanyan Steps houses only have street access via staircase. The house was then built without a garage. Now the developer-owner (presumably after he couldn’t sell the house with no garage or vehicular street access) wants the driveway. Again, I wasn’t involved at the time, so I have no idea what the developer-owner actually agreed to or why the driveway wasn’t built in the first place, but it is clear from the meetings that most neighbors feel the owner made certain representations to the City to get building permits over neighbor objections, and now that the house is built, is going back on those representations. Not sure how I ultimately feel about the driveway itself, but I do have an issue with allowing the owner to pay the City some modest “encroachment” fee in exchange for pocketing serious money through increasing the sales price of the house. The current proposal circulated by the developer-owner involves building a driveway that goes down the middle of the property and makes much of the public lot unusable by the neighborhood for its “Community Garden.” Considering how crappy our public services are due to underfunding, I think I’d rather the City just sell the lot to the developer-owner at fair market value. At least that would bring in $1M+ for the Board of Supervisors to not spend on Muni. Can one gain a prescriptive easement on City property? If so, why doesn’t this guy just start driving his SUV up that path for the next 5 years and then create a driveway? It seems unlikely that the City will send someone out to keep track of what is happening on that empty, unbuildable lot. Man, it would be such a bummer to live sandwiched between angry neighbors. As the street is “unbuildable”, the city should sell it. The lower portion along Clarendon could be merged with the lot which 1410 Stanyan Street was built to allow a drivey. A second new lot could be created on the upper portion along Mountain Spring. As Neighbor points out, if there’s approved access, there the headline is incorrect, as it would be a legal way to get to the property, thus making the owner’s attempt to create a driveway even less valid. Of course it’s completely invalid for the neighbors to try and block both the stairway (on grounds of UCSF traffic) AND access via a driveway (although I’m not sure it’s the same party complaining about both). There must be a way to get to the property, but not necessarily via a driveway. Seems like the stairway is the way to go here, especially given that there are other properties in the immediate vicinity without driveway access. If I recall correctly from reading about easements, there’s always an easement connecting a lot to the nearest point of access… but not always is that easement exactly where you want it, or big enough for a driveway. But he should be able to build a walkway along that easement, even if it’s not exactly where he wants it. Is there actually a community garden there? I see no evidence? (I know, this is not central to the story, but I’m a little curious about what the neighbors are preserving). I tend to agree with neighbor and inmycountry..if there’s no reason to have an unusable street right of way, the city should vacate it and sell it off. Lyqwyd, no one is trying to officially block the Mountain Spring stairway, as I believe that’s a done deal because of the permit. I think the Mountain Spring neighbors, however, would quietly prefer for the Clarendon driveway to be built if it meant the developer-owner abandoned the stairway permit. Yes though it looks like that room on the lower floor was designed to be easily convertible to a garage. Just replace the windows with a garage door. I’ll betcha it sits on a nice solid slab of concrete and the room is finished with an el-cheapo floor covering. After reading more about this it looks like the owner/developer is looking to reap a windfall from the city by obtaining a driveway here. Booo! The city should do something with this unused parcel. A nice SF style staircase seems like an appropriate way to improve walkability especially if it can be extended another block to Belgrave. There are other ways to address the neighbors’ concern about UCSF employee parking. Public resources for public use. Noenut – IANAL so I don’t know whether you can really obtain a prescriptive easement over public land. However I did discuss one such an option with a lawyer several years ago. That case was over rural BLM land, not city property. He didn’t eliminate that option so either it was possible or he wasn’t familiar with that nuance of the law. That case never went beyond talk though so I have no useful case to cite here. There are definitely several neighbors who take care of that lot. In the not-so-distant past, I have seen vegetables and flowers and other vegetation growing on that lot, although it’s not in the pictures on the site. What constitutes a “community garden,” though, I don’t know. I was surprised myself to hear other neighbors referring to the lot as such. But in thinking about it, if neighbors weren’t maintaining the lot, it would be an overgrown mess, which it clearly isn’t. In fact, I think someone at one meeting was kvetching to the developer-owner about her plants being torn up to make the pathway. I will say that the many of the neighbors have lived in the neighborhood for decades, and take a lot of pride in the neighborhood. So maybe calling it a “Community Garden” isn’t too much of a stretch. Any vegetation in the “Community Garden” would have destroyed during construction. What you see is probably fresh grass over the dirt. So I get the picture now. The builder is making another try to get the driveway, which is initially rejected. “liar” seems to be a fitting description for him. Stairway access is very charming. Sure you are going to turn off a fair amount of buyers by not having car access, but that’s not important to everyone. It’s SF, not exactly tough to sell here. There is absolutely no way this place got any rug pulled out from under them and I would find it extremely distasteful for the builder/owner/whatever to be trying to twist some screws or weasel this through with cash. I don’t live in the neighborhood, though, so whatevs. @lyqwyd/Wai Yip: There are five houses on the opposite (north) side of Clarendon. Their access is via a staircase down the hill from Clarendon (the “Stanyan Steps”). They do not have off-street parking. Also, I believe the easement on which the staircase to Mountain Spring is approved to be built is not on Stanyan but rather on the property of the neighbor above. I understand that that neighbor gave away the access through his property in exchange for a promise that 1410 Stanyan would not block his view. As far as I know, the owner is not currently allowed to encroach on Stanyan, which is City land. @NoeNut: The owner does not “live sandwiched between angry neighbors.” The owner is actually a developer and does not live there. After the house failed to sell, he rented it out to tenants, who live there now. In fact, the 1410 Stanyan owner called the first meeting ostensibly to discuss improving the “community garden.” The neighbors, and in particular the so-called “steward,” who realized the owner really called the meeting as a planning meeting for a driveway, made crystal clear at the meeting that they wanted the owner to have no part in “improving” their garden. 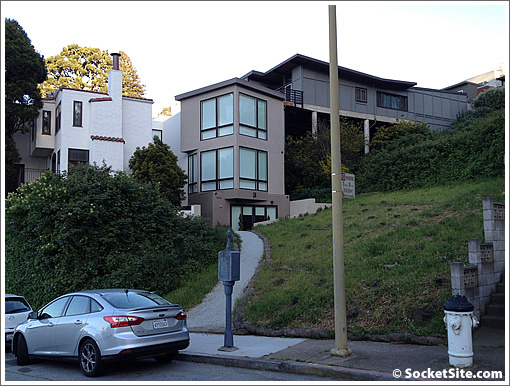 Finally, an interesting tidbit about the owner’s strategy: the owner’s proposal at the second meeting was not only to build the driveway but also a parking lot, with the spaces “dedicated” to the residents of the Stanyan Steps. He seemed to be trying to use the fact that the Stanyan Steps folks have no parking to get them on his side against the rest of the neighbors. Perhaps to his surprise, the Stanyan Steps folks expressed no interest in that proposal at the meeting, and in fact said that they would rather have no parking than build a parking lot in the open land. (1) It seems that since the lot is already situated on a “public street,” the legality would not be in question. It shouldn’t matter that the street is undeveloped. Whether he should be able to build a drive-way or path to the house seems to be another issue entirely. (2) I appraise easements. My understanding is that it is not legally possible to create a so-called “prescriptive easement” over public property. I think that would be particularly true when the public property in question is a public street, even if it is just a paper street at this point. I’m sure an attorney will chime in on this one. The city just spent almost $5 million buying a parking lot in Noe Valley about that size — they want to turn it into a park. Joanie Mitchell meets Kafka. Its the San Francisco way, baby. Stairway from street to street and walkway to the house, but no driveway. The developer crapped out, tip the dealer (build his stairs), and go cry in his beer. Shelter Cove in Pacifica. A dozen shacks down on the beach with no road that goes to it. The road from pedro point washed out years ago. The people who live there have to walk down a stairs cut in the hillside. While I’m surprised that the neighbors are concerned that a stairwell on the undeveloped portion of Stanyan would make it easier for UCSF people to park on Mountain Spring (that area is at best 0.75 mile from UCSF and much likely a longer walk), just extend the J permit up the hill Claredon and south. I highly doubt schedules at campus are flexible enough to allow someone to trek UP THE HILL (MOUNT SUTRO) AND THROUGH THE WOODS to move their car every two hours. @editor: I know it’s a nit-pick, but I stand by my opinion, the access is legal, but the stairs have not been completed. The builder/ owner was not trespassing, so the access had to have been legal. Not to say that give him the right to create a driveway. I hope the driveway plan gets stopped, seems like the neighbors are in the right on this one. I generally side with developers in this case, but the owner knew full well that there was no direct access to the street, plus that other nearby buildings had the same constraints. There’s no reason in my mind why the builder should get special consideration here. Anybody know how they got the building permit in the first place? I thought SF Planning Code requires one off street covered parking space for a residence? Thank you Another neighbor, always nice to get the local details. It really sounds as if the developer had planned all along to capture the windfall of a driveway that wasn’t reflected in the price he paid for the property. You can’t blame him for going for the free $$ if the he got approval for the driveway. This story is repeated over and over. Developer buys a disadvantaged property at a reduced price, then tries to ram through increased rights. I don’t know this to be true, but my guess is that they got a variance due to the fact that there is no direct access to the property. james, my question was actually as to how the building was constructed without access, so EH’s and the editor’s answers that the public right of way was used (i.e., the “community garden”/existing footpath) tells me what I was wondering. That this vacant lot is a vestigial street is very interesting. Seems like the developer should buy a portion from the city, or finally build that staircase. A free driveway would be better for him, of course! If he does manage to get the driveway built, why bother with a garage anyway? He’d have a long driveway which he could use to park multiple cars. I’ve wondered for years if that phantom stretch of Stanyan between Belgrade and Clarendon was originally a public stairway that got privatized. It sure looks as if it was once public. Apparently many of the public stairways vanished behind fences and gates over the decades. With a freshly built and landscaped path from Clarendon Ave to the house, 1410 Stanyan is up for sale at $2.695M. Additional building permits were pulled last fall, so perhaps the site/access issues were resolved.